For father's day 2011, my family had a big day planned for me full of fun things to do. We were planning on going to a movie and then dinner at my favorite pizza place. It was going to be a fun day that we had been looking forward to for awhile. Even though I had a full day of activities already planned, to my wife's chagrin, a sportsman always has fishing or hunting on the mind. I figured my weekend wouldn't be complete unless I slipped out for a couple hours to try my luck on the local river. I decided to wake up at 4:30 in the morning so I could be to the launch bright and early. I wanted to be on the water by 5:30 and off by 9:30 to give me time to be back for the movie. Most people think I am crazy for waking up that early on the weekend but a true sportsman has to make sacrifices to keep everybody happy. I woke up the morning of father's day and was ready to go. That morning was like any other mornings that I wake up to fish. I was full of energy and ready to catch a limit. Dreams of catching fish after fish were in my mind from the night before and it was finally time to fish. I arrived at the launch in Algonac at 5:30 as planned. I was fishing by myself so I launched the boat solo and was on the water in a matter of minutes. The temperature was a little chilly but the wind was non-existent making the river look like glass. It was an awesome day to be out. If you haven't experienced a big river like the St. Clair river in the morning, you need to do it. No matter the weather, every time I fish in the morning, the same phrase keeps ringing in my head...what a great day to be on the river. Although the morning was beautiful, the fishing was slow. I fished for three hours and only had one bite to show for my efforts. I tried everything in my arsenal of baits and still could not get a bite. It was frustrating to say the least. The only condolence I had was that the other fisherman around me were having the same amount of luck. I had yet to see a net hit the water so at least I wasn't the only one with a skunk in the boat. The only thing worse than not catching fish is seeing others around you hammering them. As slow as the fishing was, I still had another half hour until I had to be to the launch. The awesome thing about fishing is that your luck can change at any time. Your day could go from the worst ever to the best with one bite. This day was a classic example of that statement. There I was on that fateful day, drifting in my boat, frustrated that I hadn't caught a fish in over three hours and bam... a vicious strike. I knew I had a fish on and it was a good one. I was just hoping it wasn't a sheephead or other junk fish instead of a nice walleye. The fish wasn't fighting very hard but was reluctant to come to the surface. Walleye are known more for their frying ability than their fighting ability so I was optimistic I had one on. Once the fish finally reached the surface , I saw it was a big walleye. I only hoped I could net the fish by myself. I fish solo from time to time so I have netted fish by myself but never one this big. After fighting the fish for a couple of minutes, I finally had it to the surface. I figured it was now or never so I tried to muscle up the fish and net it. Unfortunately, the fish spooked at the last second and I was only able to get half of the fish in the net. The fish flopped back into the water and tried to get away. For some reason, the fish was still hooked so I tried to net it again. This time, I was able to net the fish and get it into the boat successfully. After bringing in the fish, my adrenalin was pumping. I didn't even take the time to measure the fish. I knew it was the largest I had ever caught and was very excited. I drifted a couple more times in that spot but then it was time to leave. As I motored back to the launch, I noticed some fish being caught by others. The fishing was just starting to turn on and I had to leave. As I loaded up the boat, I wasn't upset that I had to stop when the fish started to bite. 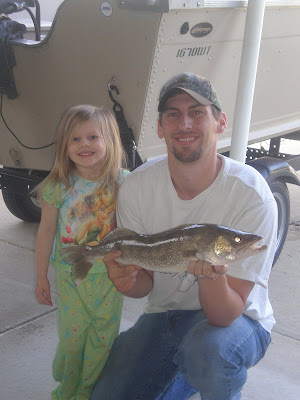 I had the biggest walleye I had ever caught in the live-well and a dinner date with my wife and daughter... life was good.